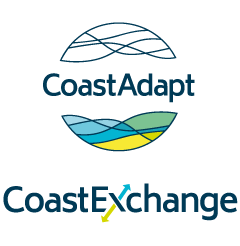 CoastAdapt was developed by the National Climate Change Adaptation Research Facility (NCCARF) with funding from the Australian Government through the Department of the Environment and Energy. The Commonwealth does not guarantee, and accepts no legal liability whatsoever arising from or connected to, the use of or reliance on any material contained on this web site or on any linked site. In particular and without limit to the generality of the above the Commonwealth does not guarantee that access to or the supply of, any material or other feature on this website will be continuous, uninterrupted or free from error. This web site contains links to other web sites that are external to NCCARF/Griffith University and the Commonwealth. NCCARF/Griffith University and the Commonwealth take reasonable care in linking web sites but have no direct control over the content of the linked web sites, the changes that may occur to the content on those web sites, or the security arrangements applying to those web sites. It is the responsibility of users to make their own decisions about the accuracy, currency, reliability and completeness of information contained on linked external web sites.